The Québécoise singer-songwriter on stage at the beautifully renovated National Arts Centre is charming and talented. But she’s also distracted. The connection between her plugged-in guitar and the amp is not working. In the audience, we can hear her lovely vocals, and the music being played by her band, but not her own strumming. If she weren’t sending increasingly frantic eye daggers to the guy at the sound board offstage, most of us wouldn’t actually notice this. But she is, and we do. In fact, although her musicianship and stage presence are strong, it’s clear that the broken technical connection is mirrored by the broken audience connection: we might as well not be there. It’s oddly fascinating… like the feeling you get when conversing with a person whose lips curve up in smile that fails to include their eyes. It’s lonely and alienating. I think, maybe if I close my own eyes, I won’t notice the disconnect. But as a perpetual communication and performance student, I can’t look away: she’s teaching me something profound about what not to do. When an audience has assembled to hear you sing (or speak), and you’re on stage, that’s a gift. Nurturing that relationship needs to be your number one priority. Another night, another free concert at the same venue, and another minor technical problem. 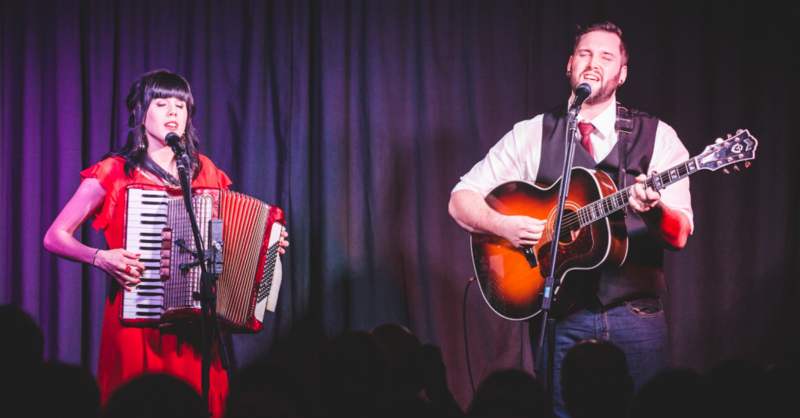 But this time, Andrew James O’Brien and Catherine Allan of the dynamic Newfoundland duo, Fortunate Ones, speak to the audience while waiting for the glitch to be fixed. “Just building suspense,” O’Brien jokes, transforming us from awkward witnesses to allied insiders. Later, he compels the audience to join in the chorus of a song most of us have never heard before. He coaxes us once, twice, three times (because of course, we’re shy). But then we do. And the reward is so worth his unselfconscious insistence. Our combined voices bind us to him and each other, making us all part of the music magic. This is especially impressive considering that because the small venue is standing-room-only, a third of the audience is actually seated around the corner. We can’t see the performers, except on a TV screen, and they can’t see us at all. We laugh at our complicity and the exaggeration. We know the power is limited. But we’ve also just seen a warm, open, confident performer exercise it well. I wish every woman I’ve ever encouraged to step up to – instead of away from – a microphone, could have witnessed this beautiful demonstration of the possibilities that come with having an amplified voice. their beginnings are in keeping with one of the core messages they carry. That sometimes the most important decision you can make is to just say YES. — a sentiment after my own heart! Their name reflects shared experience with audiences. It is about connecting people of all kinds, to make strangers friends, to elicit feelings of joy, hope, sadness, and contemplation – and the spirit that we are all in this together. …Which is exactly the kind of connection they created, and that we all secretly crave when we show up as audience members, no matter what the venue, performance or program.